Are found in Southern Africa in grassland and semi-arid regions. Live for about 7-9 years. 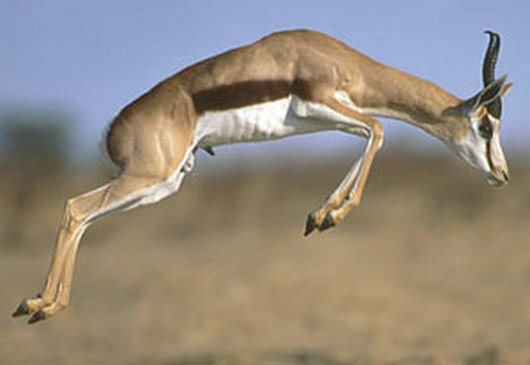 Can leap 13 feet into the air (known as stotting or pronking). Can reach speeds up to56 miles per hour, making them among the top ten fastest land animals in the world. Feed on grasses and other vegetation - eating more water-rich plants when water is scarce. The main predators are cheetahs, lions, leopards and humans. The South African national rugby union team is known as the 'Springboks'.